Growing: Â Moderate This hybrid indica dominated marijuana strain is the result of crossing Hawaiian Indica and Pure Kandahar Afghan strains. Â The result is a cannabis strain that has stable genetics and the making of a champion strain. Â It is ideal to be grown in an outdoor growing set-up and therefore can be handled even by beginners who have basic marijuana cultivation know-how. Â It grows to a medium height which is easy to maintain and does not require demanding attention to flourish.Flowering time for Aiea can be expected by middle of October and the grower can expect pretty decent yield from its weed plants. Â The buds will have lots of THC crystals and good amount of resin along with fruity aroma that will be carried to its taste when smoked. 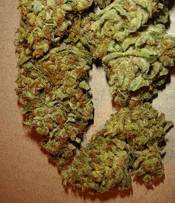 Â Expect this strain to throw a wallop of strong but clear head and body buzz that will last for hours. Â This is also good for medical marijuana users especially those with bronchial problems. Growing rare strains of marijuana has always been my passion but I canâ€™t seem to perfect the art as I always encounter mold and fungi especially when they are flowering.Â Why do you think it happens?